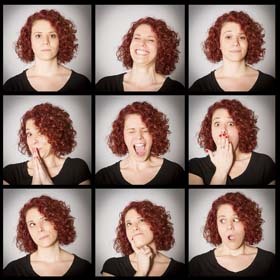 In a new study by Keiho Owada and colleagues, 18 people with autism spectrum disorders had more neutral facial expressions and fewer surprised expressions than 17 typically developing people while interacting socially. Oxytocin, a hormone that promotes social bonding, was delivered to the autism group via a nasal spray for six weeks, and made the faces of the people with autism more expressive. Oxytocin also improved their reciprocity in social interactions and increased activity in the dorsomedial prefrontal cortex, as observed via functional magnetic resonance imaging (fMRI). The study suggests not only that oxytocin can normalize facial expressions, but also that the counting of facial expressions on videos of social interactions can be used as a measure of social symptoms of autism. The research was presented at the 2016 meeting of the Society of Biological Psychiatry.